Potato skins are good for you. That was a first for my husband and armed with the new knowledge, he went home still disbelieving what he just heard and confirmed at the internet. God, I hope so. I had been eating potato skins half of my life. They actually taste good. If only I can remember how they were cooked when I used to eat them. With melted cheese perhaps, because I remember accompanying them with a cold bottle of beer. After an endless amount of meat during the Easter holiday, I was screaming seafood. It was beckoning to me. 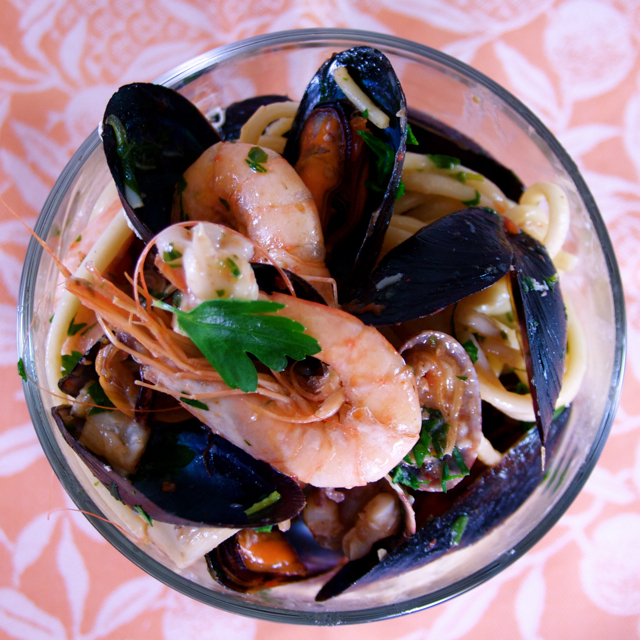 Living in a seaside town of Rome, I get to have a choice of the freshly caught aquatic marvels. On sunny weekends, whatever season it may be, throngs of people arrive in our town that it can become excessive at times. We, on the other hand, go to the opposite direction looking for greener pasture, more inland, and I imagine questioning looks darted at us leaving the beach on such a beautiful day. 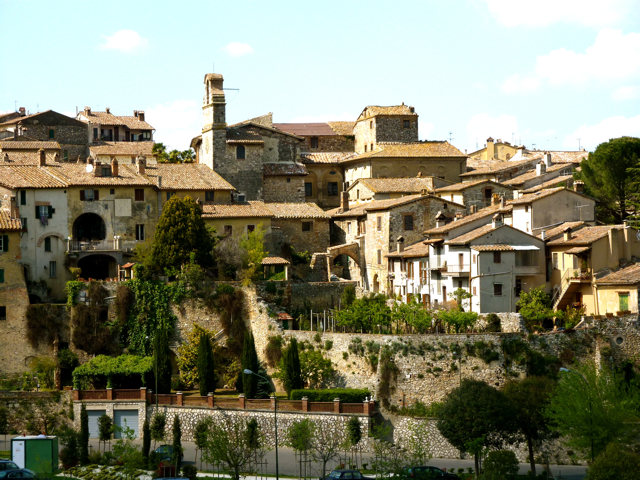 San Gemini is an Umbrian medieval village with well-maintained alleys, arches & staircases. If devoid of cars or passers-by, you would have an unsettling feeling that you are lost in another era that at times, I had to fight the urge to check my phone for confirmation that we are indeed in 2011. Walking around at lunchtime on a Sunday, there was completely no life in the streets. Everyone was either indoors, in the church or at the main piazza which we left long before. 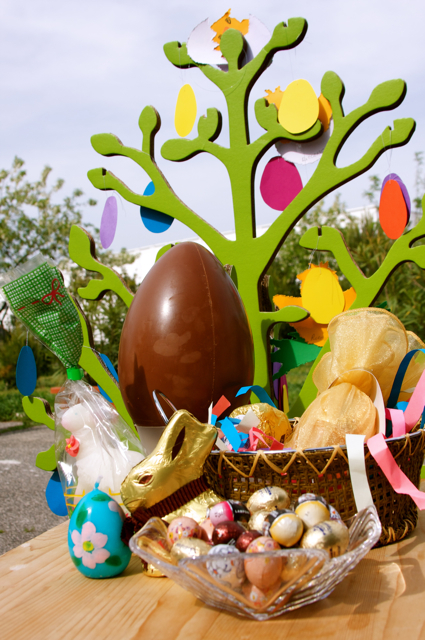 Easter in Italy, like in any other place is a family gathering where everything commences on the table and ends on the table after endless hours of eating. You sit down while the sun is still up and shining and stand up when it already finished its shift for the day and the moon's turn is up. That is, if you are still able to stand up after putting on 10 kilos in one sitting. We all know the religious significance of Easter so I will just tackle how this special day is celebrated by my family and I guess like the rest of the population in this part, the traditional way. These type of pseudoacacia trees line numerous streets in Italy. In English, it is commonly known as black locust (Mmmm, it doesn't sound so appetizing.) or robinia pseudoacacia (Now that's more like it!). The only edible part is the flower, all the rest are considered toxic. 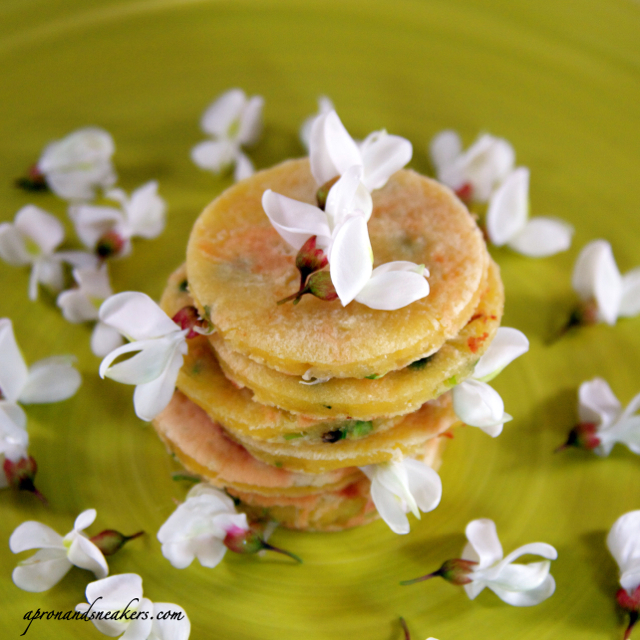 The white pea like blossoms grow in clusters and are delicately fragrant. They bloom in this period only and the flowers last between 10 - 15 days. The best time to get the flowers is when they are still closed or just opened. They are in their prime, looking succulent & fresh. Avoid the older looking ones with the dried up edges because they should have already lost their fragrance and flavor. Ball shaped food never fails to perk the interest of any child. Since I have two at home, my food balls are always welcomed with bursts of little squeaks of anticipation wondering what I put in them. Little do they know that they are just the boring old ingredients that they sometimes refuse. My five-year old sometimes segregates the food in his plate, "to eat" side and "not to eat" side. With everything mashed and mixed together in the ball, he would be needing a magnifying glass to go through his little stint of taking away what he deems unpalatable. 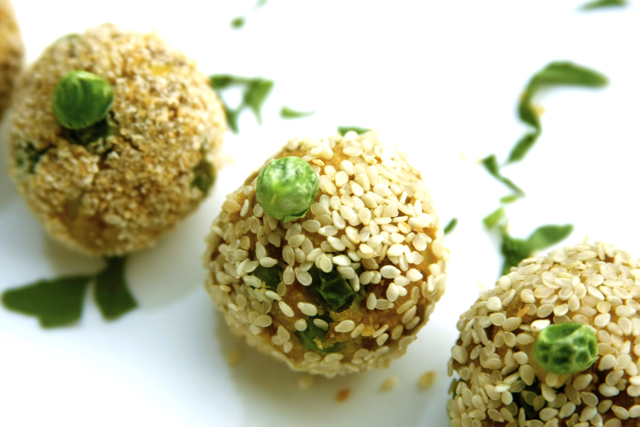 These balls are simple and dependably good. I roasted them in the oven instead of deep frying them. Sure, they should be tastier and have more moisture but as much as I can, I try to evade frying because it can get heavy on the kids' digestion. A tad less sumptuous but nonetheless still delicious. 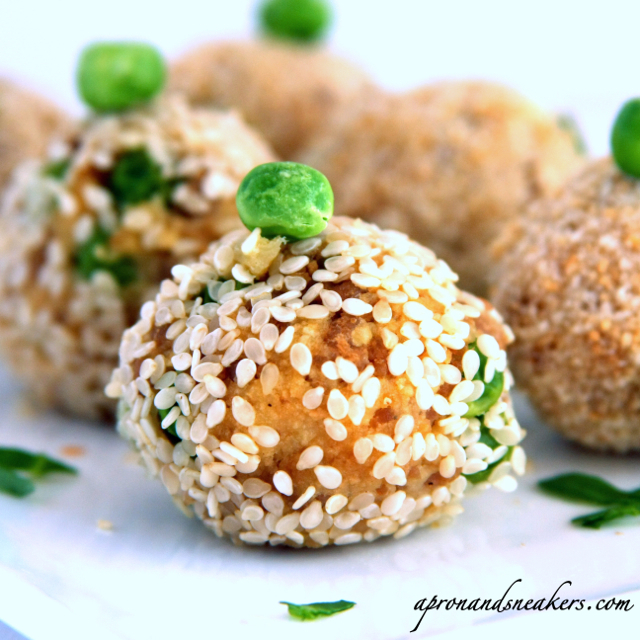 I covered some with sesame seeds and some with breadcrumbs. The tastes are almost identical so it doesn't matter what you cover them with. I served them drizzled with soy sauce mixed with lemon. 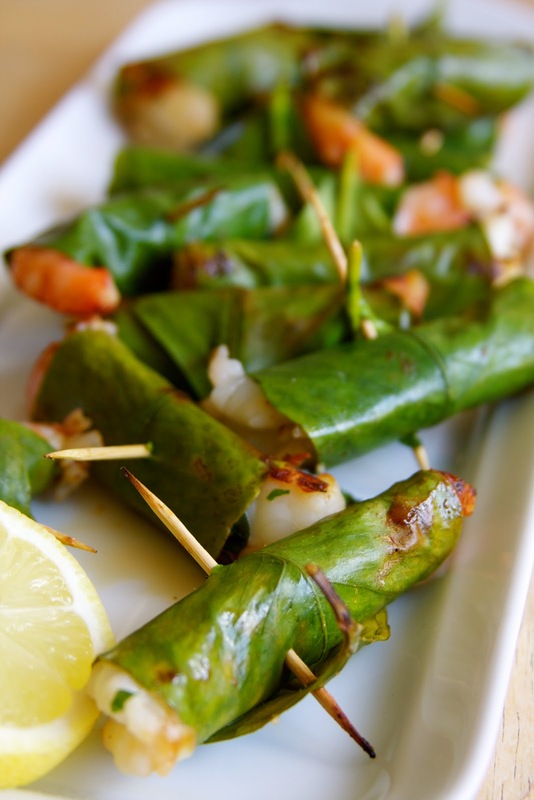 Serve as appetizer, main dish or a surprise for the little ones. 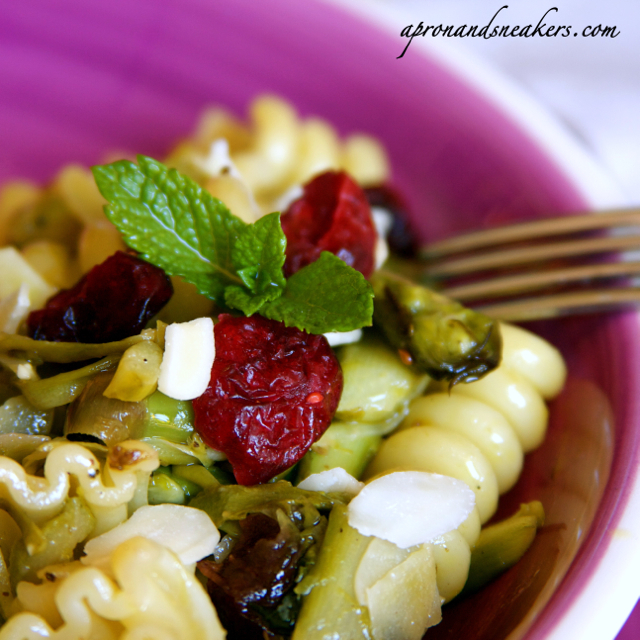 If there is any pasta that I can associate with spring, this one comes to mind. This recipe was a product of panic. Panic that 15 minutes before mealtime, I still didn't have food on the table nor in my mind. 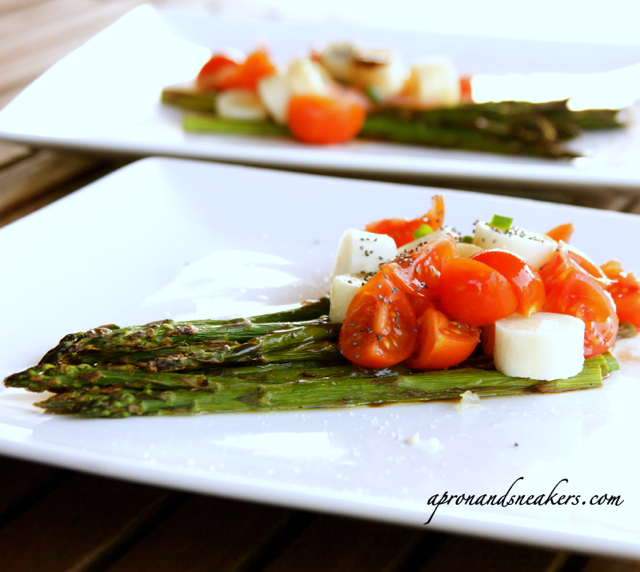 I did have a fresh bunch of asparagus but it ends there. I can easily steam them as a side dish but there is the problem of the main dish. I didn't have any. I have a couple of frozen sea bass but they can't be defrosted and cooked with one snap of the fingers. Unfortunately, I'm not Wonder Woman. As I rummaged through my cupboards once, twice, thrice....sigh. I finally settled for the almonds and dried cranberries. I never tried this combination before but as I mentally associate the ingredients with their corresponding tastes, there seems to be a possibility. Foglie d'ulivo means olive leaves. This is the first time I saw this type of pasta, my husband included. There's nothing much written about it in the internet which makes me certain that this is not a classic shape. I couldn't even find it in the list of classic & new types of pasta. As far I can find out, it is produced only in some regions of Italy namely Liguria, Campania, Toscana & Puglia. My foglie d'ulivo came from Puglia. What attracted me to this rice is its color. It's naturally black. I don't really have a certain predilection for black food, I just find them so mysterious and aesthetic especially when combined with red and green. But I won't put any black food in my mouth unless I know what it is or what is in it. Black hides everything and I like to have visual discernment of what I eat. 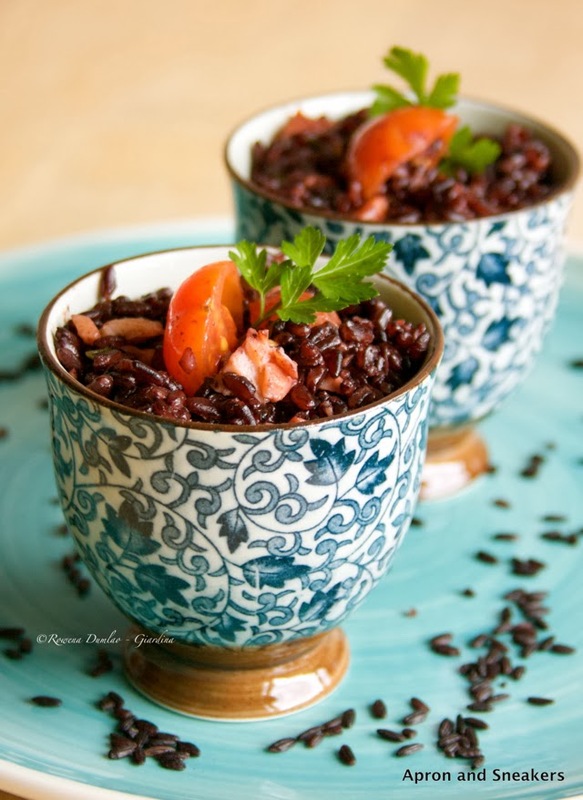 Since this is the first time I encountered venere rice, I had to get to know more about it. It mystified me why it is naturally black. It has a high vegetal substance content called antocians. 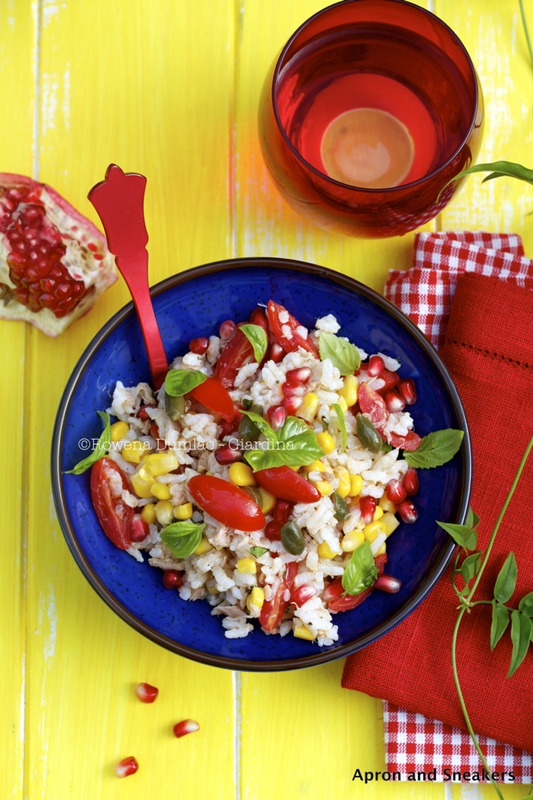 Its iron content is four times higher than the normal rice and the selenium is twice higher. This makes it good in anti-ageing and increasing the immune defense system. Oh, yes! 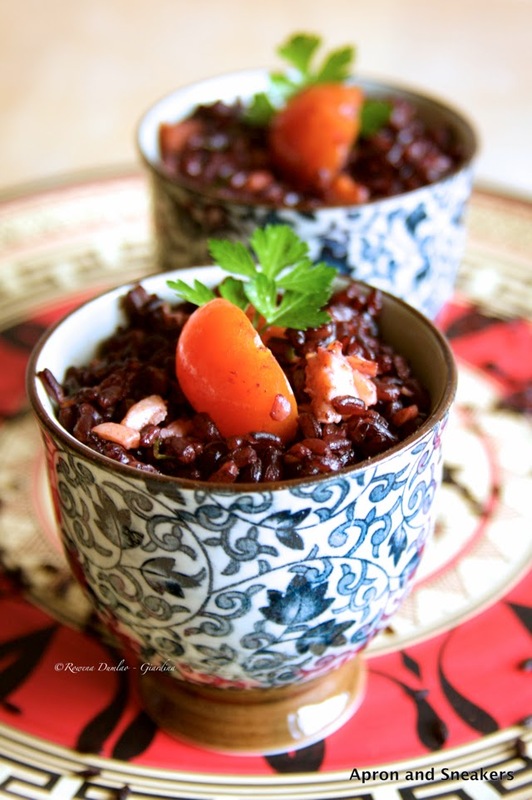 Born in the Po Valley of Italy, it is a cross-breed between an Italian variety and Asian black rice. In China, this kind of rice has existed since 12800 B.C. It was cultivated only for the emperors and their courts until the 19th century because it was rare and the production was scarce. It is still more expensive than the normal rice even in Italy. I really had no idea how to cook this rice. Luckily, the box came with a suggested recipe. And what do you know, I have all the ingredients on hand. The first thing I noticed about this rice is the smell. It smells so wonderful while cooking! Reading the box again, it did say that it has a characteristic aroma of freshly baked bread. Freshly baked bread is one home aroma I am crazy about. If only I can bottle it and keep it. Aroma, flavour & appearance. This rice has everything I like in a food. Welcome to my cupboard, venere. Cook the rice in a pot with 1-3/4 cup salted water. In another saucepan, over medium heat, sautè the garlic in extra virgin olive oil (about 3 tablespoons). Discard the garlic when it turns brown. Add the cherry tomatoes and toss for about a minute. Then add the salmon. Toss for a minute. Add the white wine and simmer until sauce is reduced. Transfer the cooked rice in the saucepan of the salmon & tomato mixture. Sprinkle with the chopped parsley & salt. Drizzle with extra virgin olive oil. When these green spears start their public appearance, I am one of the first grabbers in the market. 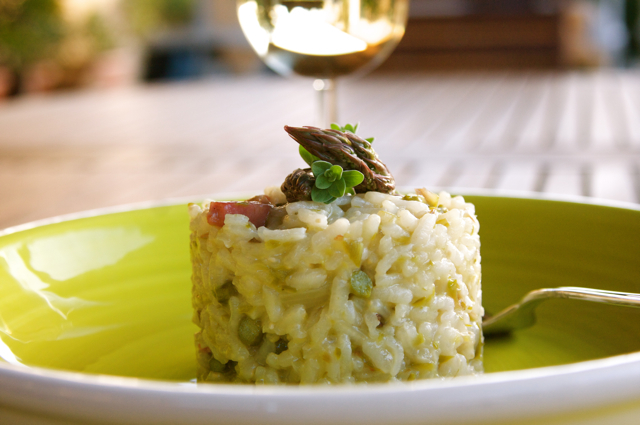 I love asparagus and they have a designated permanency in our annual spring menu. I enjoy eating them steamed, drizzled with extra virgin olive oil and sprinkled with salt. Simple, plain and healthy. 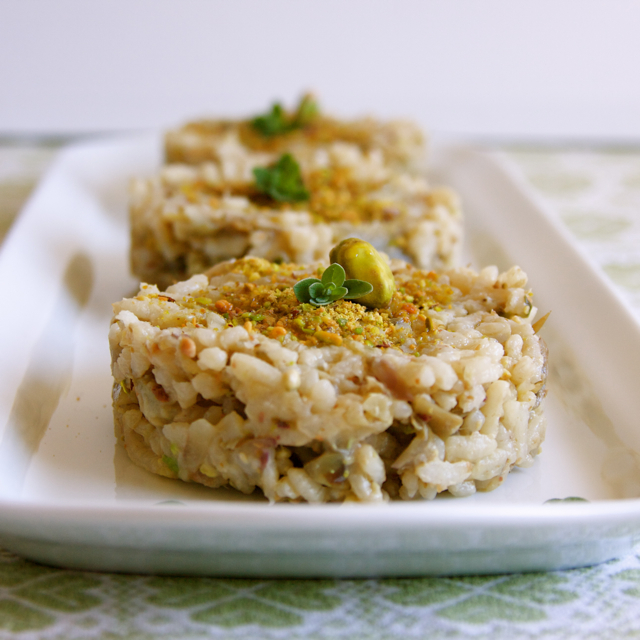 Lately, I had been fixated in cooking risotti. Whenever I get my hands on some fresh vegetables, they automatically get drowned in wine, rice & hot broth. Maybe because the temperature suddenly crept up that I feel like winter packed up everything in one night and didn't leave any trace of the cold behind that it's just apropos to eat cold and tepid food. Since my husband and I enjoy the risotti better when they are lukewarm, not scalding hot like the pasta dishes, then risotti are perfect to enjoy for the sudden warmth we are experiencing. Pseudocereal (so͞oˈdō-sîrˌē-əl) n. Any of several plants, that do not belong to the grass family but produce fruit and seeds used as flour for bread and other staples. I never encountered this word before until I bought some quinoa and buckwheat from the world market. Both are very nutritious and gluten free. I'm still finding out different ways to cook the quinoa and there seems to be a vast world behind this ancient pseudocereal from South America. On the other hand, I am familiar with buckwheat because I like torta di grano saraceno or buckwheat cake which is one of the typical cakes of Alto Aldige in northern Italy. Pasta con ragu' is my Italian comfort food. After splurging on different contemporary dishes, it's a relief to go back to basic and taste this familiar tomato and meat sauce sprinkled with a torrential amount of parmigiano reggiano. Ragu' is the tomato and meat sauce popularized worldwide with the name bolognese. It's actually ragu' alla bolognese. 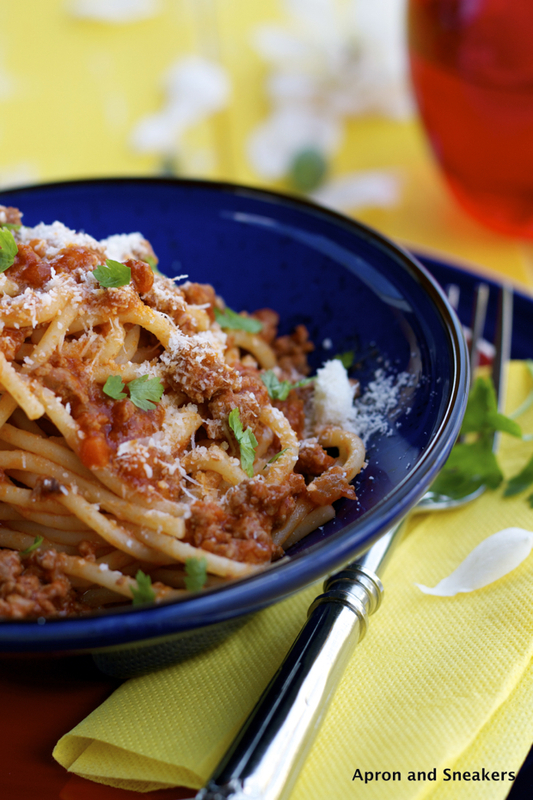 Bolognese signifies that it comes from Bologna, Italy. 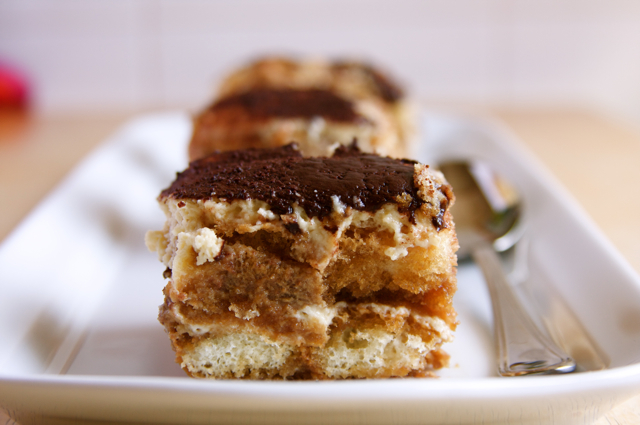 When I was younger, I never thought the name tiramisù has a meaning. It literally means pick me up. And it does pick you up with the ingredients in it. I like tiramisù but I rarely order it in the restaurants because it gets overshadowed by other cakes that seize my attention. It's always present among the desserts of the restaurants that it seems that the printing of menus has tiramisù already pre-printed in it because almost every restaurant has it. 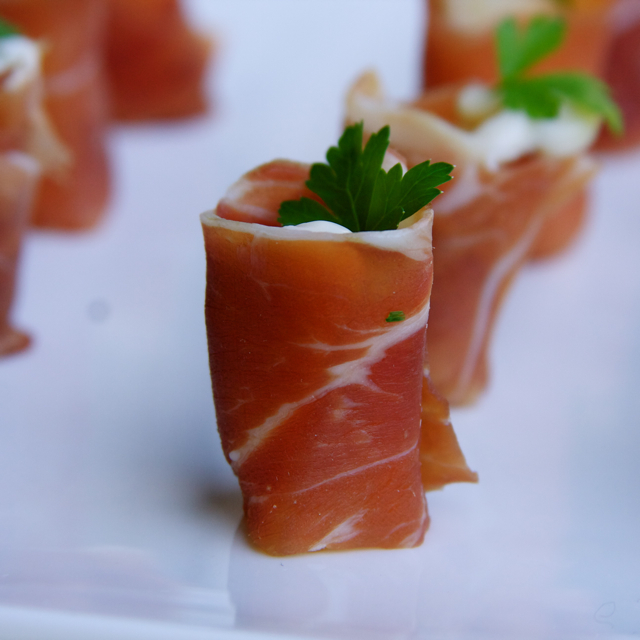 If you are in a rush and have no idea what to prepare for starters, grab these three ingredients and roll away. It takes very little time and effort and you can come up with some presentable and sumptuous rolls. I guess gorgonzola has a peculiarity that some tiptoe around whether to eat it or not. 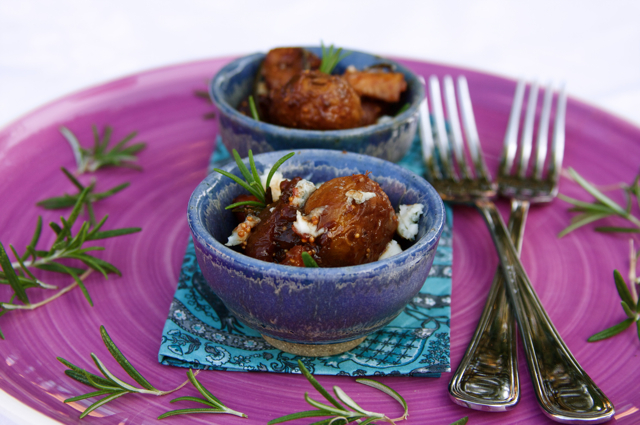 Blue cheese, wherever it comes from, is always delicious. If a promise of eating ice cream to a child works its wonders, this pasta dish does to mine. For a child of five, it is a tad strange to latch on to this dish as a topnotch favorite. In fact, I recently cooked this as a desperate move to suppress an erupting tantrum. 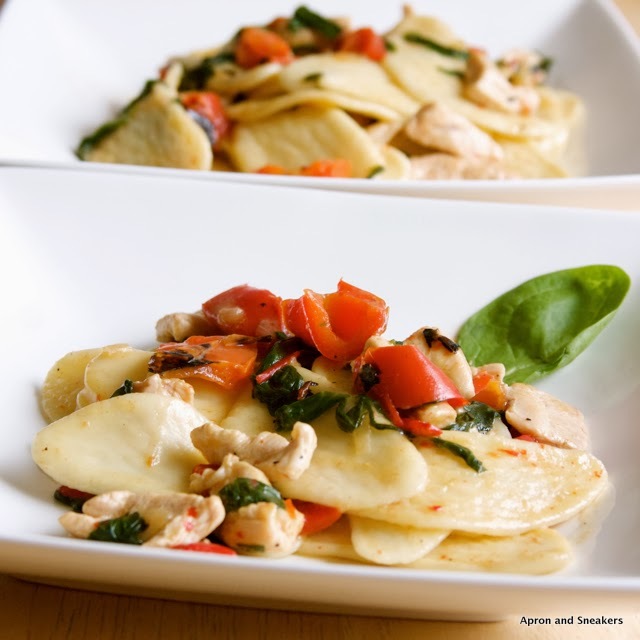 This is a very easy & quick dish that never fails to impress my family, even myself. It's one of my favorites. The more classic Sicilian dish that uses Marsala wine is scaloppine di vitello al Marsala which are fine thin slices of veal cooked in Marsala wine. 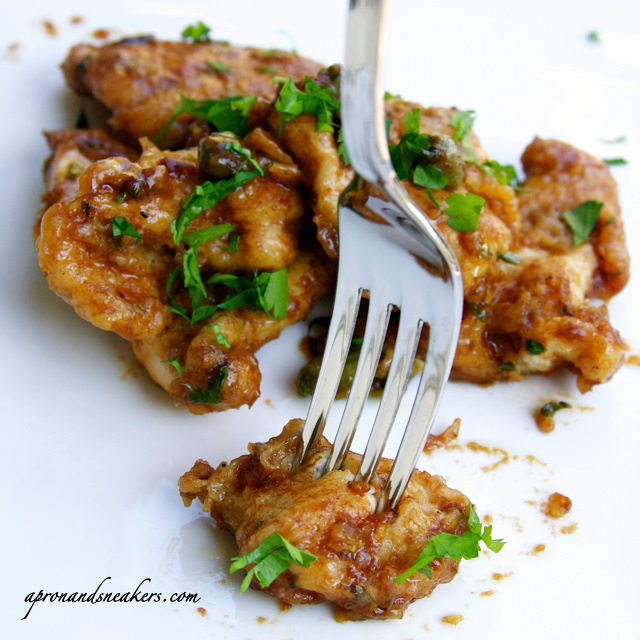 This one on the other hand are smaller pieces of chicken (the white meat) cooked in freshly squeezed lemon juice and Marsala with a bit of capers. It's absolutely something that you should try! Being a family day, I usually prepare something more special than usual on Sundays if ever we are home but if I have an incurable Sunday attack of laziness, I just rely on what is lying around the kitchen. The supermarkets close in the middle of the day while all the other shops are closed so I do my shopping in the cupboards, refrigerator & freezer. After scanning my refrigerator, I was able to take out some leftover boiled rice, cherry tomatoes & a sliced pomegranate. 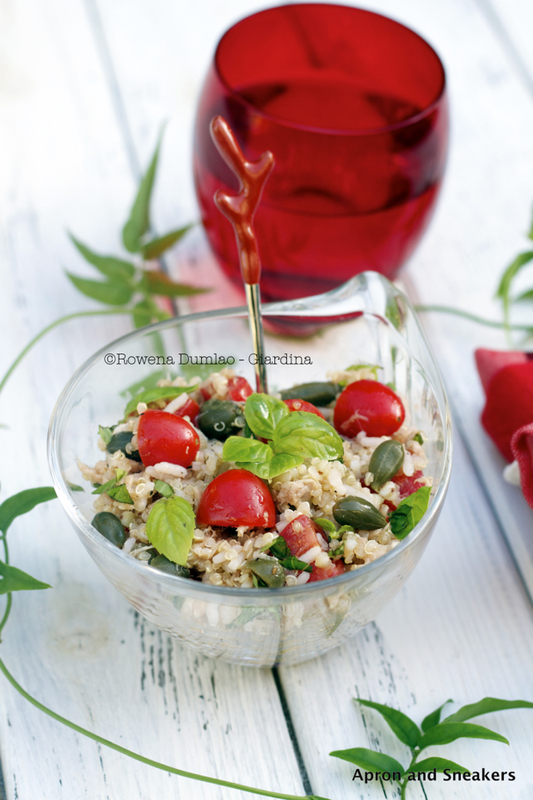 I can already see an insalata di riso (rice salad) taking shape. Rummaging in my cupboard, I got the other main ingredient, canned tuna. I also got a can of corn kernels & a bottle of palm heart or palmito. 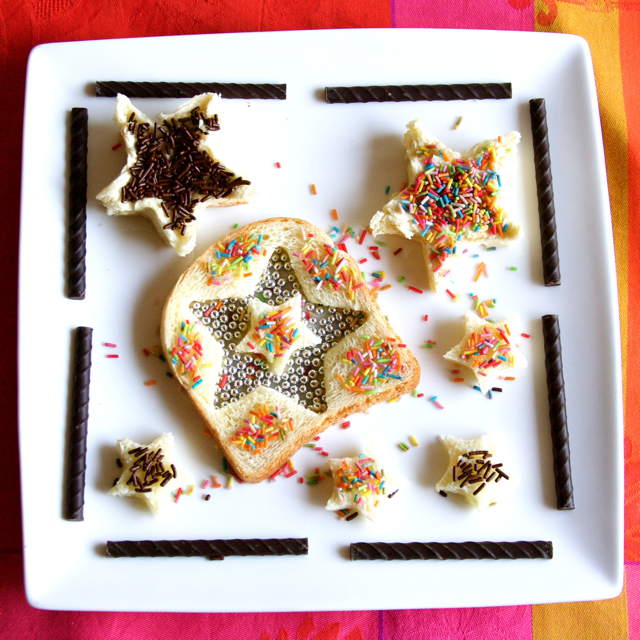 Star shaped bread with candy & chocolate sprinkles with chocolate & cappuccino sticks. I have not been diligent with my five-year old's plates lately because of lack of free time but here are three of the recent ones I prepared. He loves bread so much, mixed with oil, honey, sugar & lemon or Nutella so most of the plates I prepare for him are based on bread. Apart from my son's enthusiastic response to the plates I prepare for him, I also enjoy thinking of ways to make eating a pleasant adventure for him. First things first, I started a cookie cutter collection and different kinds of candy sprinkles. And the most fundamental of all, a creative streak to blend the main ingredients together. What started as an April Fool's Day joke for my son became a dessert. Since he has this dislike of artificially colored food, especially blue, I thought I would make him some blue rice since he recently requested for a dinner of rice, eggs & ketchup. 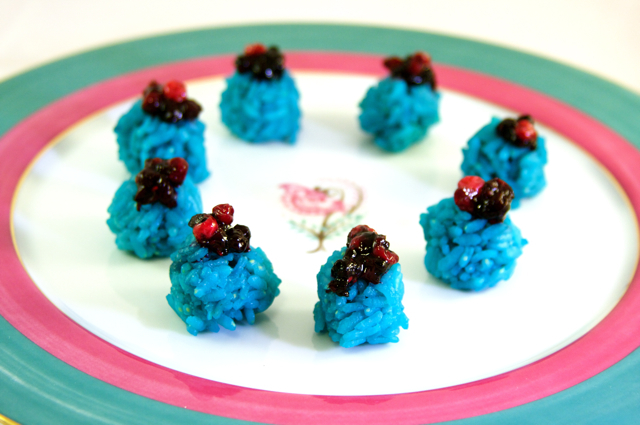 At the last minute, I incorporated some sugar to the rice and thought of making sweet rice balls topped with frutti di bosco or mixed berries. I still have the leftover pack in the freezer that I used for making ice cream toppings. I knew he wasn't going to eat it anyway so I adapted it to my taste. At least it won't go to waste. I was also hesitant to include the blue rice in his dinner plate because he has this strange fixation that his food can get contaminated by the "blue thing". The last time I made a salmon plate for him with some blue gel to make it colorful, he was horrified that his salmon & bread were touching the unidentified blue objects in his plate. I find it strange, because when I was a kid, I used to eat a lot of blue bubblegum ice cream. My friends and I, like the rest of the kid population were crazy about it. The ice cream itself wasn't so much to speak about but the color was bright blue, just like these rice balls. Like a child again, I had a plateful to feed my blue food predilection all over again. 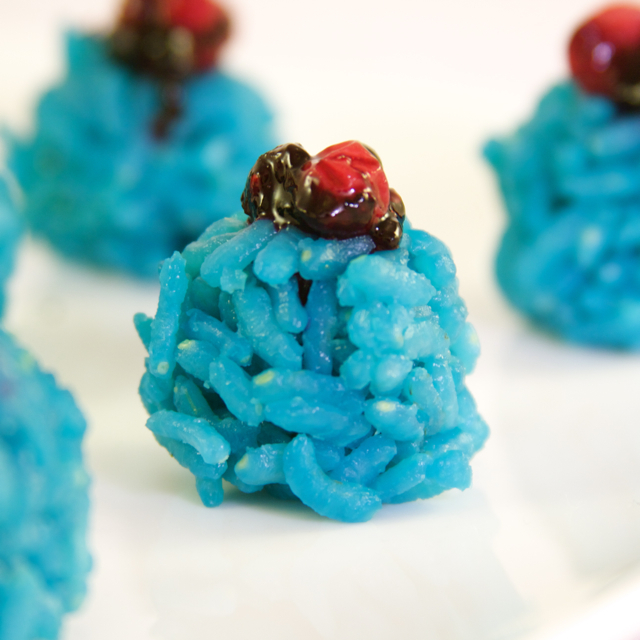 Over high heat, in a small pot, bring to a boil the rice mixed with 1 cup of water, 1 tablespoon of sugar & food coloring. When it boils, put down the fire to low, cover partially, then cook for about 15 minutes or until rice is fully cooked. Move it once in a while to avoid sticking to the pot & burning. Maintain an almost creamy consistency. Transfer to a bowl and let it cool. Make the balls when the temperature is okay to handle. 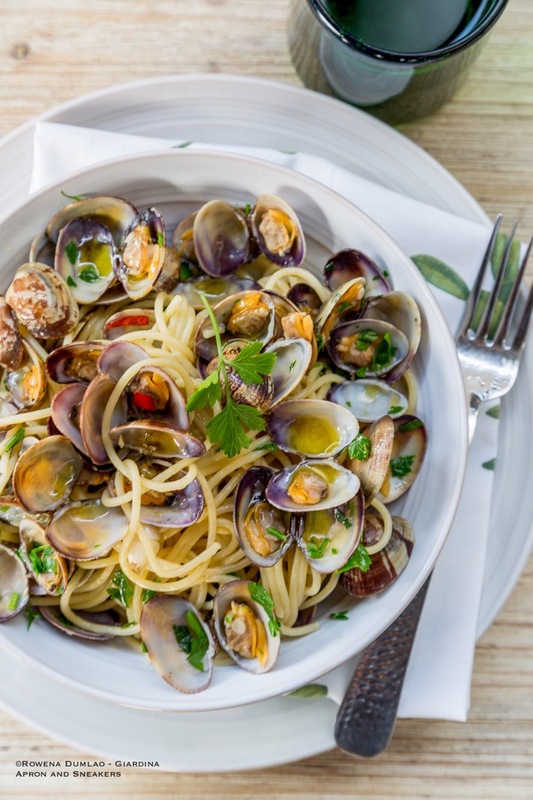 To make the sauce, combine the frutti di bosco with a tablespoon of water, a tablespoon of sugar and a quick squeeze of a lemon. Boil until it becomes thick. Grilling shrimp straight on the fire at their utmost simplicity, zero condiment, is the only way I enjoy them. On warmer seasons, my husband grills them outside. On colder months, I deshell them and it's my turn to grill them on the stovetop griddle. I don't put any salt nor oil. It's so sumptuous this way.